The Avengers: Infinity War trailer has finally hit! This is it. This is the culmination of the last decade of Marvel movies. Everything that has happened in the Marvel Cinematic Universe up to this point has all been leading to this. Thanos is here and he is ready to bring down The Avengers and everyone else who has ever stood for good in the MCU. That's right, Marvel fans. After a whole lot of impatient waiting, Marvel Studios has finally released the teaser trailer. And it is everything you want it to be. 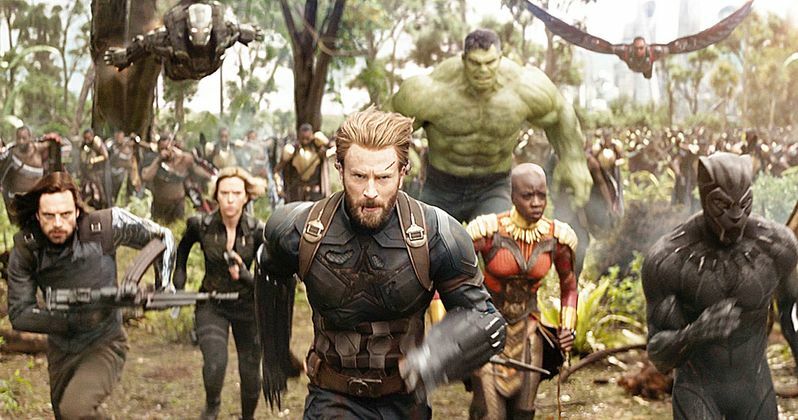 Marvel Studios first unveiled this Avengers 3 teaser trailer during Disney's D23 Expo over the summer, which was exclusively for those in attendance at the event. Just a week later, Marvel also decided to show the first footage from the latest chapter in the Marvel Cinematic Universe during the Hall H presentation at San Diego Comic-Con. To the frustration of a great many fans, the studio still didn't release the trailer following the showing at SDCC. Some very low-quality leaks made their way online, but that's no way to watch something this epic. Now, finally, you can watch the trailer in all of its glory for yourself. Strap in, because there's a lot going on here. The trailer delivers on every promise that has been made to us in regards to Infinity War. The ending shot reveals the Guardians of the Galaxy, who come into contact with the God of Thunder, who is now wearing an eyepatch. Elsewhere in this first look footage, we see Peter Parker actually uses his Spidey sense, which is something that was a bit absent from Spider-Man: Homecoming. There are other quick shots of Loki, Iron Man and more, but once Thanos arrives, the main event starts. We see many heroes like Doctor Strange and Star-Lord duking it out with the Mad Titan, with Spider-Man doing so in a brand new Iron Spider suit. We also see Captain America gone Nomad, and a Blonde Black Widow. But sadly, the money shot of Thanos throwing a planet was something only the Comic-Con and D23 crowd got to see. Avengers: Infinity War, as well as Avengers 4, are being directed by Joe Russo and Anthony Russo. The duo has tackled Captain America: The Winter Solider and Captain America: Civil War previously, which are both considered to be among the best movies in the MCU so far. Even before the trailer was released, it seemed as though this massive event was in very good hands. They are going to have one hell of a balancing act to pull off, as virtually everyone who has ever appeared in an MCU movie is going to be in this thing. It's going to make that airport scene from Civil War look small, and that's really saying something. Marvel is finally going to unleash Avengers: Infinity War on May 4, 2018. Avengers 4 will follow a year later on May 3, 2019. We've all been waiting for this ever since we saw Thanos in that post-credits scene from The Avengers more than five years ago. It's time. Be sure to check out the first Avengers: Infinity War teaser trailer for yourself below.